Crazy Rich Asians is a rom-com that’s heavy on the rom and lighter on the com. 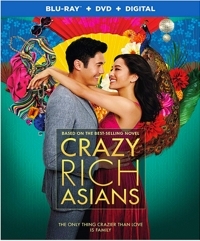 There are plenty of amusing moments, mind you, but this 2018 film by Jon M. Chu has more in common with splendiferous romances like Pride and Prejudice than it does the old Doris Day-Rock Hudson romantic comedies that depended mostly on farcical misunderstandings and mistaken identities. The plot is pretty straightforward: it’s a variation on the old meet-the-parents theme, with a couple’s future on the line. 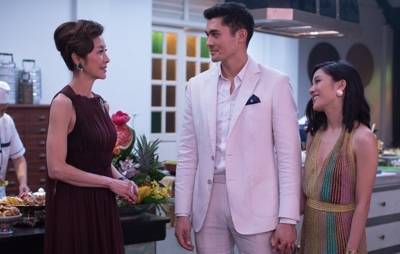 Based on the international best-selling novel by Kevin Kwan, Crazy Rich Asians features Fresh off the Boat’s Constance Wu as Rachel Chu, the serious girlfriend of Nick Young (Henry Golding) who flies to Singapore to be his plus-one for his country’s wedding of the century. When they fly in an airline suite, she learns for the first time just how rich Nick’s family is, and that’s the main complicating factor. She may be an American success story—the daughter of a hardworking single mom who made Mom proud by becoming an economics professor—but in Singapore she has two strikes against her: she’s comparatively poor, and she’s Chinese American rather than Chinese. Nick’s family, meanwhile, is like the Singapore version of the Kennedys—old money who built Singapore and who now draw paparazzi to them as if they were royalty. As the tagline says, “The only thing crazier than love is family,” and the humor derives more from characters and their mannerisms and quips than from situations. Awkwafina is pretty hilarious as Rachel’s old college roommate who is unabashedly flamboyant and lives with her mother in a Singapore mansion, while Nico Santos is equally funny as a gay friend of the Young family. Ken Jeong makes an appearance as Rachel’s old roommate’s wealthy father, but he isn’t given nearly as much screen time as the younger generation. The family itself is a bit like the parents in Gilmore Girls—rich and loving it. Still, romance (or the lack of it) is at the heart of this film, and that’s reinforced by side plots and minor characters. One cousin is rich enough to buy a million dollar pair of earrings on a whim, but her husband is cheating on her. Other family members seem comically desperate to find someone. And Nick, the one who has found someone, finds his life complicated by a mother and grandmother who are more concerned about their family standing and reputation than by individual family members’ happiness. We get scenes of some pretty wild (and elaborate) bachelor and bachelorette parties, and along the way there’s some awesome footage of Singapore and a pretty unique wedding. The film was shot on location in Singapore and Malaysia, and people who love reality shows that focus on how the ultra-rich live will love the sumptuous visual detail that makes Crazy Rich Asians a fun film to watch. Bigger or better houses and parties are seldom to be found, and it all sparkles on high-def Blu-ray. Wu and Golding make for a believable couple, and their characters are warm and likable. But the plot of this comedy really turns on the “blockers” who would try to stop this romance from going any further. The island’s rich and jealous mean girls provide some memorable moments, but it’s Michelle Yeoh (Tomorrow Never Dies, Crouching Tiger Hidden Dragon) who really delivers a beautifully nuanced performance as Nick’s domineering mother. Crazy Rich Asians never strays far from the rom-com formula, but the rich Asian angle makes enough of a difference that the film seems somehow fresh, and little details—like dialogue in English but many of the familiar background songs sung in Chinese—really add a lot. The bottom line is that this film gives fans everything they want and expect from a romantic comedy.